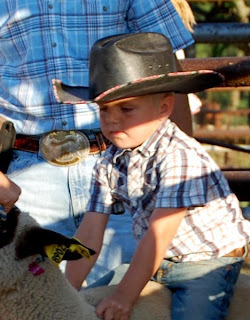 For a few months now all Little Cowpoke can talk about is how much he wants to ride sheep. 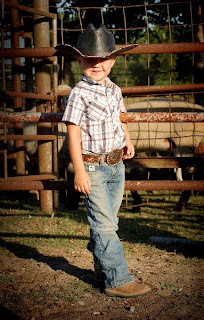 Little Cowpoke had ridden a sheep one time when he was two, but ever since then we haven't been back to that rodeo. 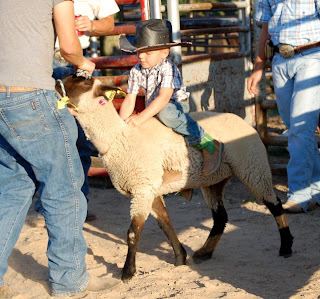 Well, for Little Cowpoke's 4th birthday, we took him to ride some wild buckin sheep. Well, at least the sheep part is true. Mr. 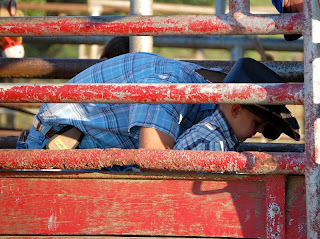 Cowboy and Little Cowpoke went behind the chutes to take a look at the ridding stock. Little Cowpoke said he wanted to ride the biggest one because the smaller ones buck more crazy. Hey, that seems like some pretty good logic to me! Mr. 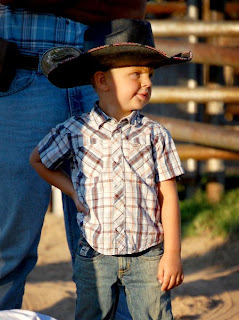 Cowboy is all into the fact that Little Cowpoke wants to ride bulls. I had to talk Little Cowpoke into just riding sheep. He wanted to go straight to the big bucking bulls. It's crazy how some kids just have that crazy gene in them. I must have missed that gene, but Mr. Cowboy sure has it. Hey there my little stud muffin. I can't believe he is four years old. 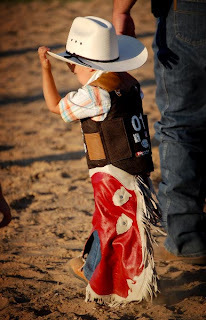 How time flies........ And there is nothing cuter than a little cowboy wearing some Cinch Jeans. 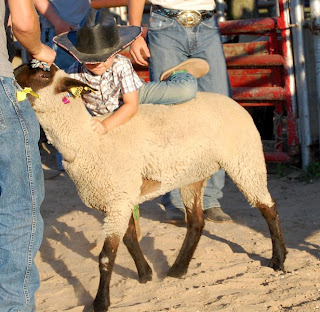 Little Cowpoke was really excited to get on a sheep. He wasn't nervous one bit. He even ate some chips before his ride. I think I was more nervous than he was. 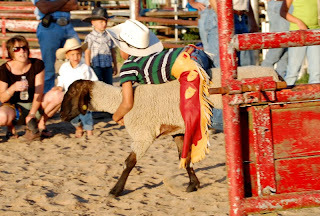 The rodeo started and Mutton Busting is the first event. Little Cowpoke was the second name to go. Mr. Cowboy went in the chute with him. It's great how Little Cowpoke has such a good coach. Mr. 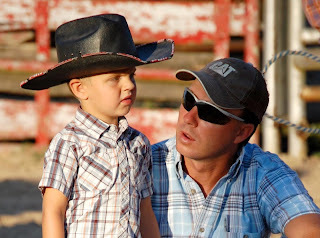 Cowboy said that Little Cowpoke was breathing really deep and acting all serious. You just never know when those sheep are going to go crazy. Then when Little Cowpoke was all set to go, the gate was open and out they went! Go man GO!!! Then it was time to dismount! 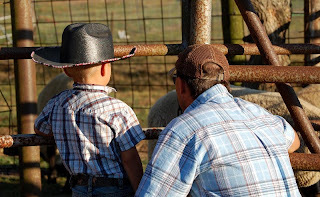 Little Cowpoke and I had talked about a safe way to get off the sheep. You have to plan your "falling" off. Good job, Little Cowpoke. A lot of the other kids were falling right in front of the sheep and then getting run over. 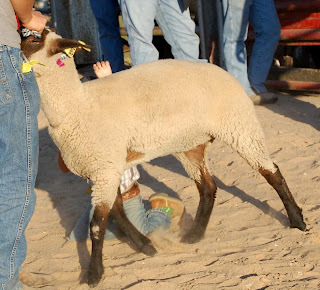 When Little Cowpoke is not longer in lead line Mutton Bustin, then he is going to have to let go of his hands first so he doesn't end up under the sheep's neck. After the ride, Mr. 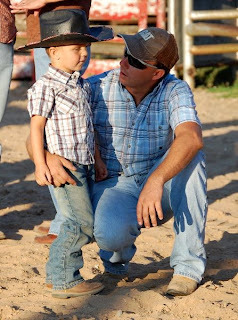 Cowboy took Little Cowpoke to the side where they talked about his ride and made plans for a better ride next time. They watched the other sheep riders go. Some of the other kids stayed on a lot longer and some just fell right off. There were a lot of two year old boys riding. But I think Little Cowpoke did a good job. He is excited to get back out there and try again. Maybe next time we can look as smooth as that kid! Talk about adorable!! No wonder the bull riders always got the girls. 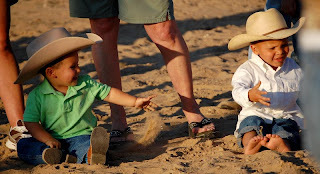 They were so cute in their chaps and hats! These two dirty boys rode in Little Cowpokes division. They were some tough kids. But I think they enjoyed playing in the dirt a bit more than riding the sheep. This guy tried so hard to hold on, but his sheep was a fast little bugger! And this boy cracked me up. He hung on to that sheep half way down the arena. Then the sheep stopped running and he just kept hanging on. 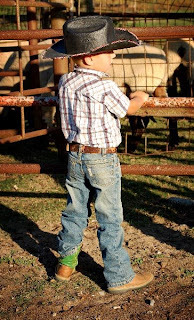 After he jumped off, his mom told me that they were headed to Buna, Texas for another Mutton Bustin. At seven years old, he is already running the roads! And I think Little Cowpoke might need some more Man Time. He is starting to stand like his Mother!! Happy Birthday Little Cowpoke! Saturday is his birthday party and I will post pictures of that tomorrow! Happy Birthday to little cowpoke. He's a big boy now riding sheep. They all look so cute and like they are having a great time. Very serious work. A very Happy Birthday.....I had never heard of riding sheep before.. So cute! Happy birthday little cowpoke! Happy Birthday little cowpoke!! He looks so adorable out there!! Way to go! Too cute. Tell little Cowpoke I had 2 cowboys over my shoulder and they thought he looked mighty fine. 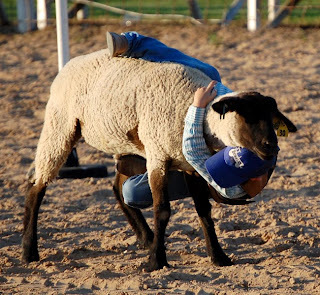 Hahaha cute I remember mutton busting. Fun stuff. Go Cowboy Go! Happy Birthday to Little Cowpoke!! Love the story and pictures. I didn't actually know you could ride sheep either. Seems fun! Oh my goodness what a cutie! He did a good job, the look of concentration on his sweet face just cracked me up! GOOD JOB! Love the coaching shots too, what a good Daddy! That is the cutest thing EVER!! Go Little Cowpoke!!! Oh goodness, that is SO cute! Great pictures, Andrea. He looked so good...what a neat way for him and Mr. 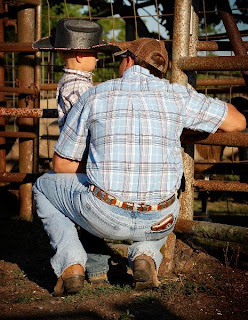 Cowboy to have some quality father/son time. I can't believe he's 4! Hope he had a happy birthday!! Way to go! You finally got to Muttin Bust! Savannah was so excited at her finals on Sunday, that she got a good sheep! Very cute! Yeah a lot of parent just get gun-ho serious right from the get go. 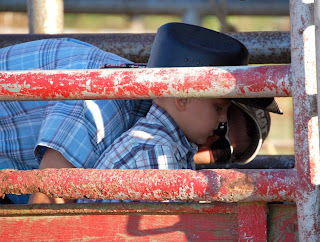 In a way I wish my parent would've done that with me for horse showing...but I know it's not for every kid. 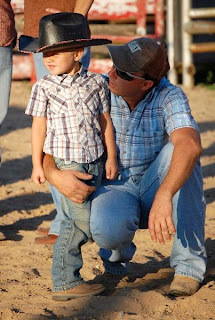 Awwww, I love these photos, especially the ones of Father and Son. Precious I tell ya! Way to go Little Cowpoke!